Somehow my two kids just ate six bananas. I don't even understand how it's possible for two boys to eat six bananas in ten minutes. When I went to the grocery store today I bought myself a bunch of fruit for smoothies. Apparently that was not a great idea. I bought two big banana bunches and my kids have already eaten an entire bunch. Now I get to go back to the store tomorrow to buy more. They also ate the entire can of smoked almonds I bought myself for snacks. My husband and I joke that we need to get our own cupboard and put a lock on it, I'm beginning to think it's not such a bad idea. I dread the thought of having two teenage boys, I think I throw in the towel already. With it being the middle of winter I have been making a lot of soups and stews. I love having a hot meal when the weather is cold outside. 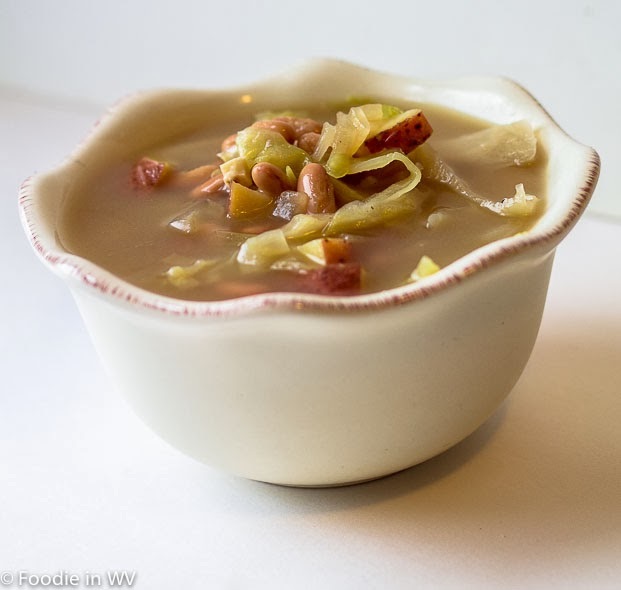 Last week I tried a new recipe for Cabbage, White Bean, and Potato Soup from the January 2014 issue of Southern Living magazine. This recipe has 9 ingredients. It takes 30 minutes of total time, all of which is active and makes 10 cups. I did make a few changes to the original recipe. First, I used small red potatoes cut into fourths instead of fingerling potatoes. Fingerling potatoes were overpriced at my local grocery store and would have cost 2 1/2 times as much as the red potatoes I bought. For the chicken broth, I used homemade. I have discussed many times about the benefits of homemade stock, it's cheaper, tastes better, and you can control the amount of sodium. I chose not to add Parmesan cheese as a topping for my serving, but my husband and two boys did. If you are serving this soup for dinner it needs a sandwich served with it in order to be filling. Alone it doesn't have enough protein or fat to be filling for most adults. It would be great with grilled cheese or a grilled (or not) turkey sandwich. The flavors are great and with a sandwich it would be a quick evening meal. For the recipe go to Cabbage, White Bean, and Potato Soup. I'd love a bowl of this soup with half a sandwich for lunch. Perfection! It would be perfect with a sandwich! i love soups. you got it right with a grilled cheese! perfection! I'm a big fan of soups too! Hahahaha - my boys are like that with bananas, too! I buy about 20 bananas a week and they are gone in no time. Glad to know that my boys aren't the only ones :) I had to buy more bananas today! So hearty, can't wait to try this out. My husband loves bananas too. The soup looks warming and delicious. My boys ate 5 more today! This soup really is warm and perfect for cold weather! I hate it when it rains all the time :( I hope you have sunny weather soon! It really is good and would make a nice meal with a sandwich!